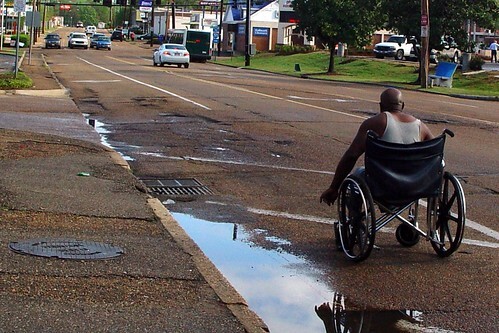 Transportation for America this last week released a report on a dire situation for pedestrians in the nation’s cities. In the last 15 years, more than 76,000 Americans have been killed while crossing or walking along a street in their community. More than 43,000 Americans – including 3,906 children under 16 – have been killed this decade alone. This is the equivalent of a jumbo jet going down roughly every month, yet it receives nothing like the kind of attention that would surely follow such a disaster. Children, the elderly, and ethnic minorities are disproportionately represented in this figure, but people of all ages and all walks of life have been struck down in the simple act of walking. These deaths typically are labeled “accidents,” and attributed to error on the part of motorist or pedestrian. In fact, however, an overwhelming proportion share a similar factor: They occurred along roadways that were dangerous by design, streets that were engineered for speeding cars and made little or no provision for people on foot, in wheelchairs or on a bicycle. Walkable communities are safe and inviting for walking and bicycling, while also featuring compact development and a variety of destinations, such as parks and public space and nearby schools, workplaces and other amenities like restaurants and retail facilities. The tools to increase community livability by improving walkability go beyond investing in pedestrian infrastructure, giving residents and visitors convenient destinations they can walk to. I don’t mean to start a battle between north and south, but I found it interesting that the worst 10 were all in southern states. CCPE collects park acreage data on 8 of those principal cities listed above and will be adding Orlando and Birmingham this year. It would be interesting to look at total parkland vs. walkability in cities.